September 25, 2015 (Powerhomebiz.net) liquivid is a lightweight, easy-to-use desktop app for video and photo correction. Its intuitive and clutter-free user interface packs all essential features required to improve your captures’ quality with a minimum of time and effort. People using action cameras to record sports videos and other hobbyist videographers now have a simple yet effective way for removing blemishes like camera shake, lens distortion or flat colors. The app is currently available in version 1.2.0 for Windows (64 bit) and Mac OS X (10.9 or later). Free Trial Version: http://liquivid.com/download/, free to use for 14 days without limitations to functionality. Activation required after trial period. Footage recorded with helmet cameras, aerial drones or without a tripod are generally shaky and often affected by other flaws like lens distortion (fish eye effect) or flat colors and contrast. For all who want to get more out of their captures, liquivid offers a series of essential post-processing features: The app removes camera shake, making it ideal for correcting action clips and free hand recordings. Additionally, the software contains lens profiles for a wide range of action cameras and other wide angle lenses, allowing for the removal of their characteristic lens distortion. The app can also remove image noise caused by low light and high ISO settings and improve sharpness, contrast, saturation and white balance. 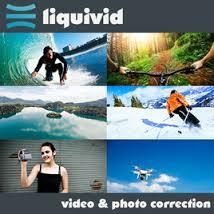 Liquivid can also change a clip’s framerate, creating a slow-motion effect for footage recorded at high frame rates. The application contains lens profiles for GoPro Hero 3, 3+ and 4, Sony HDR-AS100V, Drift HD Ghost, SJCAM SJ4000 and SJ 5000, DJI Phantom 3, Garmin VIRB and Rollei 6S and 410 and also allows for the easy creation of custom profiles. Liquivid handles both photos (JPG, PNG, TIFF) and videos in all common formats and resolutions, including HD and 4K. Stills are exported as either JPG or PNG and videos as MP4 (H.264), WMV or uncompressed AVI. The software’s main focus is simplicity and usability and offers two editing modes: The “Basic” mode for fast one-click-corrections and an “Advanced” mode for more detailed tuning. The batch processing capability makes the app particularly useful when applying similar corrections to a large number of files. The software is available on the liquivid website, the Mac App Store and Steam for $19.99, offering good value for its. The developer Razvan Chisu and his team create apps for Mac and Windows desktop systems, focusing on usefulness and ease of use. With liquivid, the developer offers a powerful video and photo editing solution aimed particularly at action cam users and videography beginners. The app is currently available in version 1.2.0 for Windows (64 bit) and Mac OS X (10.9 or later) and is localized into English, German, French, Italian and Spanish.